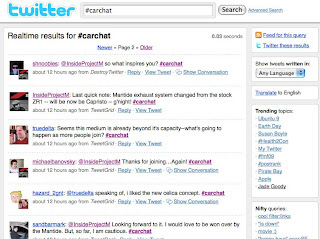 There is a small but growing car phenomenon on Twitter called #CarChat. It is a regularly scheduled event every Wednesday evening from 8pm – 10pm EST where fellow automotive journalists, enthusiasts and anyone interested in discussing cars is welcome to join in on a Twitter discussion by following and posting comments using the text “#carchat”. There is a “How-To: #carchat” post on vLane.com that tells you how to engage in the online discussion. I finally had an opportunity to participate tonight. Unfortunately, the time doesn’t work the best for me as I’m usually in the middle of helping my wife put our twin three year old boys to sleep, but I was able to sneak a few posts and follow the discussion during our normal tucking in routine. Aesthetics and design-wise? What are your preferences for a dream car? So is it better to all drive efficient small cars to conserve fuel, or switch to electrics and burn it somewhere else? Has anyone here driven an electric car? Thoughts? Anyway, #carchat is an interesting experiment on Twitter and one I hope some of my fellow automotive enthusiasts will follow. Maybe we can even discuss some of the marketing done by automotive brands in a future #carchat session? Get the #carchat - Twitter Search widget and many other great free widgets at Widgetbox!